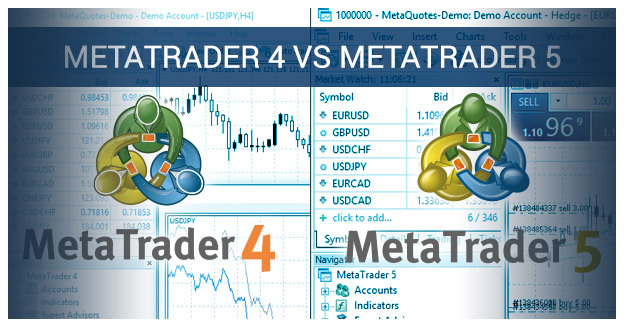 The retail forex trading arena is fraught with individual nomenclature, insistent opinions and recurring debates often spiked around the benefits of MetaTrader 4 (MT4) versus the newer MetaTrader 5 (MT5). MetaQuotes Software released the now-famous MT4 during 2005, while MT5 hit the shelves in 2010. MetaQuotes' software has always been built to allow for a lot of user tweaking, possibly the most important feature contributing to its rise and persistent popularity. The developers correctly identified the essential need of traders to feel informed and “in control” on a trading platform, loading intel, tweaking and trading as they see fit, where MT4 very successfully met these needs. MT4 is typically licensed to forex brokerages who then sell the software on to clients, or often supply it as part of course fees. The costs are also often recouped in trading subtleties of slightly higher spreads or broker commissions. This means that the server is handled by the broker, while the retail investor employs it to view streaming intel, tweak their desired signals and actively trade on a daily basis. Indeed, MT4’s ability to accommodate user preferences in the forex trading arena is the base value that has made it a household name the world over. Alongside its ability to interface with trading bots, these two components of MT4 collared the market, and has since never been dethroned. In addition, many Mac OS versions are built and supplied by brokerages to their clients, further extending the app’s reach. So far so good, but there are further reasons why the release of MT5 in 2010 never saw the world dumping MT4 and upgrading. That reason is the fact that MT5 was never designed to replace MT4. It’s not an upgrade, but rather accommodates a greater diversity of traders, including those looking at stocks, bonds or otherwise employing different instruments in their trading. Against this backdrop - and remembering that it can be confusing, having a similarly-named but numerically superior (MT”5”) product launched a few years down the line - it becomes logical to view them as distinct, separate products. It’s easiest to think of the two apps as children from the same family. They share much, including a surname (or in this case, a first name) and have a host of similarities, coming from the same house, but they remain individuals, ultimately incomparable beyond a certain point. Indeed, comparison is the wrong point of departure, much like modern investors often bluntly employ traditional forex metrics with cryptocurrencies. It holds for a short way, but there are certain key differences that have to be acknowledged in order to make clear sense of specific trading activities. All of this is further complicated by the fact that the developers opted to trade on their existing work in large, building MT5 “over” the MT4 shell by only adding specific tweaks needed for stock traders; hence the reason behind the “old” MT4’s persistent dominance in retail forex trading to this day. MT4 is the forex trader’s platform. MT5 carries the same amenable nature, allowing for tweaked inputs and relevant intel to aid investors, but is wholly geared for trading on all markets other than the forex markets. MetaQuotes developers designed MT5 to reach out to non-forex traders, hoping to collar the growing retail trading of commodities, stocks and other market entities. So, MT4 is for forex and MT5 for everything else. The end. Yes, that’s the bottom line, but it’s also not quite so simple, as there are a host of subtleties that can confuse particularly new traders when appraising the apps. This is why, since the MT5 “upgrade,” MT4 is still the one, the name, the platform to trade forex. The release of MT5 isn’t analogous with something like a Windows update or improvement. It was and remains a different product, designed for different things. It has been a stroke of savvy workmanship for the stable to build a similarly designed app for stock traders, but that cloak of familiarity often confuses the fact that the two products are ultimately very different, no matter what functionality MT5 has borrowed from MT4. As an example, comparing the two apps is like comparing an orbital sander to a belt sander. Yes, they’re both sanding machines, but employing one where the other is needed would be laughable for woodworkers. They would probably go out of business, actually. Similarly, determining a personal focus at the outset makes “comparison” very easy. If you’re trading forex, forget about MT5. If you’re trading anything else, forget about MT4. Once clarified, choosing the correct platform is a whole lot simpler and avoids any ultimately dissatisfactory comparisons between the apps. Any trader swinging between both worlds would do best to either run both apps on separate machines, or let their service provider (broker) build a “married” platform that enables both stock and forex trading. Otherwise, it’s seldom a successful DIY attempt. There is a persistent contingent of traders who feel that they can glean tweaks from MT5 to apply to MT4, but they’re usually misguided at best, or simply wrong at worst. It has been shown that manually changing MT4 to include elements or features of MT5 often causes more problems than it solves, as most features are not interchangeable, having been specifically designed for their respective environments. A fundamental difference not depicted in quick snapshot comparisons is that MT5 is designed to trade wholly different markets - as forex and its dynamics are unique - and plug into centralised exchanges. This is born from the fact that commodities and stocks must typically be traded via a centralised exchange in order to affect a legitimate and ultimately legally compliant change of ownership of assets. Also, another major impetus behind MT5’s build was the fact that clients of US forex brokerages are obliged to adhere to first-in-first-out (FIFO) regulation. In a nutshell, this means that any one trade must be closed before another same-pair and/or same-lot trade can be opened. MT4 enables management of every individual position, whereas MT5 will automatically aggregate all of a trader’s positions. Thus only MT4 can accommodate hedging, a major bugbear for global MT5 traders who are not, like their US counterparts, barred from hedging in any case. MT5’s automatic amalgamation is the primary reason why many forex traders have never gone over to the app.. Though a rather negligible benefit to new traders, seasoned traders will recognise another important difference between the apps. MT5’s back testing functionality is super fast, saving a lot of time in comparison to MT4. It also enables the simultaneous back testing of multiple currencies, another boost for those who do extensive, time-consuming back testing. The MT5 app employs a programming language known as MQL5, whereas MT4 employs the MQL4 language. Another rather exciting aspect of MQL5 is that it enables “black box” programming. Put simply, this means it presents as a better, more intuitive architecture for bot developers and traders, as well as trading resellers, who often train the retail investing community. Cyprus-based MetaQuotes brought this black box capability to MQL4 during 2014, so it isn’t really a legitimate difference any longer. Industry observers do note, however, that any future upgrading of MQL5 will not be extrapolated to the MT4 platform. Also, there is no backwards compatibility; code written for MT4 cannot be applied to MT5, another reason to exit a comparison and rather target the right app for the right markets. Rather than comparing apples with pears, pick your needs at the outset based on exactly what you’re trading. Forget about “marrying” the two or “upgrading” to MT5. If you need a lot of back testing online, or have to comply with US legislation, and are looking to trade stocks and commodities, MT5 is your answer. In addition, MT5 becomes a logical platform to employ for many retail traders who are still undecided on this issue and note that capped MT4 will struggle to reach certain exchanges. Remember, MT5 was launched to cater for US and non-forex markets. The practical application of both platforms for many years has revealed the often elusive truth, that overall MT4 remains the gold standard for forex traders, notwithstanding the release of MT5. When one looks at the persistent, fundamental needs of forex traders, the majority of global traders will point out that the real value of a trading platform comes in ease and simplicity, its savvy and enabling focus on the target market, as well as reliability. Although MT4 can be seen to have some irksome features that persist to this day, it remains able to excel on these terms, and thus remains the principal forex platform, over and above MT5. Any voice pitching the “comparable” nature of both apps is missing the point. A far more important consideration for most retail traders comes in their choice of broker. Having settled on a forex brokerage, the vast majority will notably offer access to MT4 by default, for good reason. This industry’s reality further depicts the inherently valuable nature of MT4, while also pointing to the fact that MT5 was never destined to be an “upgrade,” but rather a wholly distinct approach to wholly different markets. All content is provided for your information only. This article may contain opinions and is not advice or a recommendation to buy, sell or hold any investment. No representation or warranty is given on the present or future value or price of any investment, and investors should form their own view on any proposed investment. This article has not been prepared in accordance with legal requirements designed to promote the independence of investment research and is considered a marketing communication. Non-independent research is not subject to FCA rules prohibiting dealing ahead of research, however we have put controls in place (including dealing restrictions, physical and information barriers) to manage potential conflicts of interest presented by such dealing. One Financial Markets expressly disclaims all liability from actions or transactions arising out of the usage of this content. By using our services, you expressly agree to hold One Financial Markets harmless against any claims whatsoever and confirm that your actions are at your sole discretion and risk.